Ah, 1970. You could start an album with wind chimes and impressionistic piano and people would listen -- and love it. 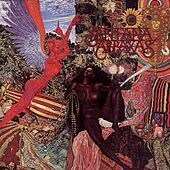 Thank Abraxas for some of Santana's greatest songs ("Black Magic Woman," "Oye Como Va"), but lesser-knowns like "Incident At Neshabur" and "El Nicoya" are just as interesting. This was the final flowering of San Francisco's vibrant 1960s rock scene.